HVAC and Refrigeration Systems covers all aspects of residential and light commercial heating, ventilation, and air conditioning systems including their effects on indoor air quality. The textbook also includes heating and refrigeration basics, thermodynamics, combustion and fuels, psychrometrics, mechanical devices, and system controls. 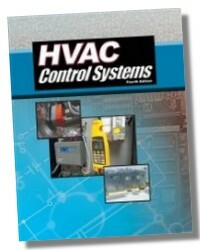 The main focus of the textbook is to provide an understanding of the procedures for installing, servicing, and troubleshooting all residential and light commercial HVAC systems. Systems covered include forced-air, forced-air split, hydronic, steam, air and water heat pumps, geothermal heat pumps, packaged rooftop units, and chillers. 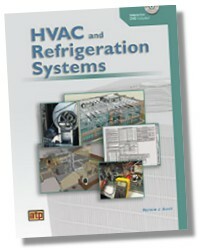 The HVAC and Refrigeration Systems DVD provides an in-depth look at the operation and troubleshooting of all residential and light commercial HVAC systems using 3D graphics, interactive animations, and interactive simulations. 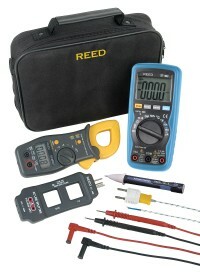 Step-by-step procedures using 3D graphics provide a clear understanding of the skills required to install, service, and troubleshoot all residential and light commercial systems. 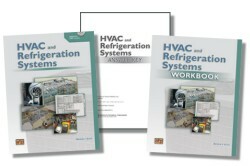 The HVAC and Refrigeration Systems Answer Key (Optional) includes answers to the questions presented in the HVAC and Refrigeration Systems Text and Workbook. 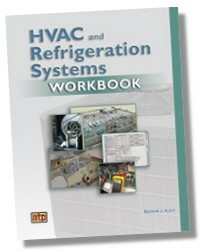 The HVAC and Refrigeration Systems Workbook is designed to reinforce concepts and provide system information and design activities for the material presented in HVAC and Refrigeration Systems textbook.